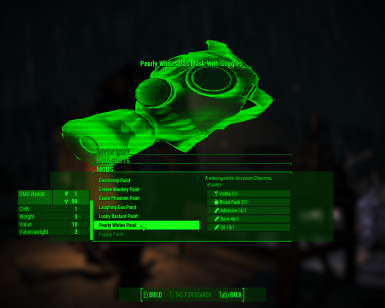 Fixes some leveled list issues that made gas masks to spawn in raiders without paint. Removed armorsmith recipes for the old standalone masks, as those are not paintable. Edits S.P.E.C.I.A.L. 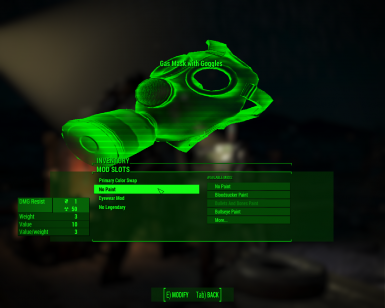 Raider Gas Masks and Raider Overhaul's mask leveled lists, so any mask you find in raiders will be a customizable one. Makes regular Gas Masks with Goggles customizable in the Armor Workbench. Have you ever been tired of finding regular looking Gas Masks with goggles but couldn't do anything with the raider ones? Or just wish that you could customize one yourself instead of having to wait for a raider to pop up with the mask you want? Then this is the mod for you. This mod uses both S.P.E.C.I.A.L. Raider Gas Masks and Raider Overhaul's masks, but instead of having all of them as separate items, they are now just painted Gas Masks With Goggles, so you can unpaint them, or repaint them with the paint you want. 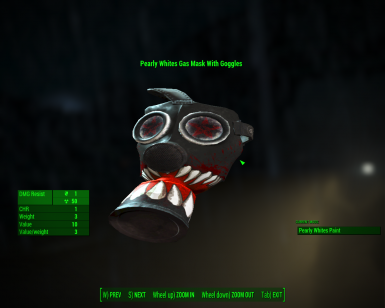 The naming is automatic, so if you repaint a "Gas Mask With Goggles" with the "Pearly Whites" paint for example, it turns into a "Pearly Whites Gas Mask With Goggles" automatically. Each paint has a SPECIAL bonus according to what it represents and is crafted with immersive recipes. Version 1 just makes regular Gas Masks with Goggles customizable in the Armor Workbench, version 2 will replace the masks in the leveled lists and leveled list scripts. Anything that doesn't change the Gas Mask with Goggles is compatible. If for some reason you have a mod that modifies it, to make a patch simply copy the "GasMaskPaintable" keyword to the keywords in the Gas Mask with Goggles, and the "GasMaskRaiderPaints" keyword to the Attach Points with FO4Edit. lists, so any mask you find in raiders will be a customizable one. one in your inventory, that way it doesn't clutter up your menu. Because of how materials are handled, the Laughing Gas Mask won't have the goggles "replaced" (painted upon and glowing), but instead will have the normal goggles that come with the mask. This isn't a bug, it's the fact that some of Raider Overhaul's masks have two separate materials for the some of the masks. This is handy if you use mods like Eyewear and Mask Retexture, that make the goggles transparent. That way, they will stay transparent. THIS MATERIAL IS NOT MADE, GUARANTEED OR SUPPORTED BY BETHESDA GAME STUDIOS OR ITS AFFILIATES.